What's the difference between memory and hard disk space? - Ask Leo! The difference between the various types of things we might call "memory" is a fundamental concept that's often confused. I'll review the basics. Memory, hard disk, and RAM: I get a surprising number of questions that show a misunderstanding between these most basic of computer terms. The most common mix-up is that people believe they are the same. While they’re not, I can see how it could be easy to confuse them at a conceptual level. So, let me explain these three terms. RAM stands for Random Access Memory. RAM is a collection of electronic circuitry where your computer’s programs and data are stored when it is running. As you can see to the right, RAM is one or more small circuit boards containing several integrated circuits where the actual microscopic circuitry lives. Each computer typically comes with a certain amount of RAM installed. It also has a limit to how much total RAM it can contain. The machine I’m using as I type originally came with two gigabytes (roughly two billion bytes) of RAM, and has since been upgraded to its maximum capacity of eight gigabytes. This maximum is a hardware limitation of the main computer circuit board or “mother board” into which the RAM modules are inserted. If I wanted to exceed this limit, this computer would need a new motherboard, although most folks would simply get a new computer with greater capacity. The one characteristic that differentiates RAM from other types of data storage is that it requires power to retain its contents. Remove power from RAM and it forgets everything that it had contained. A hard disk is a physical device that typically resides in your computer, although it’s very common to have external hard drives connected to your machine using USB or Firewire. The machine that I’m working on now came with a 300-gigabyte drive. It has since been upgraded to include a one terabyte (one trillion bytes) drive, a 1.5 terabyte drive internally and a 500-gigabyte drive attached via a USB connection. Hard disk space = hard disk space. I can see why there’s confusion. As hard disks are used to save and “remember” stuff, this certainly sounds like memory. But that’s simply not how memory is used when it comes to computers. Newer technologies blur the lines of which technology is used where. Flash memory, for example, is used to make USB Thumb drives. Flash memory is a type of circuitry that’s similar to RAM, except that it retains its contents when power is removed . Hence, it’s most frequently used to create what we’ve come to call USB sticks, thumbdrives, jump drives, RAM sticks and a whole collection of other terminology. Circuitry, sort of like RAM, is used to make storage that’s sort of like a hard drive. The important take-away here is that flash devices, even though they use flash memory, are not referred to as simply “memory”. If anything, they’re simply called drives, or flash drives. Occasionally, they might be called flash memory but it’s the “flash” that distinguishes this from the plain old “memory”, which is RAM. SSDs give us another opportunity for confusion in terms. SSDs are devices that act like large capacity internal hard drives, but are made using flash memory. They’re similar to USB thumbdrives, except bigger, faster, more expensive and use a higher quality of flash memory designed to actually replace a traditional hard disk drive inside a computer. Flash memory is faster than a spinning hard drive, thus SSDs are typically much faster than traditional hard drives. Even though they are made using flash memory, an SSD is not referred to as memory. It is used as a disk drive equivalent, and therefore it’s referred to as a “disk drive”, even though no disks are actually used. Can a USB thumbdrive “wear out”? - While the technology continues to improve, the fact is that flash memory has a limited number of times it can be written to. It can, in fact, wear out. « Previous post: How do I log into Windows automatically? I use the analogy that a hard disk is the bookshelf that holds the books, while RAM is the book which you are reading. A bit simplistic, but it seems to get the idea across. The RAM/Memory is your desk. The bigger it is, the more tasks you can work on at the same time. If it’s too small for all the tasks you’re working on at once, it gets cluttered and slows you down. Sometimes analogies are just as hard to understand as the thing being described. I used to teach a basic computer class and the way I would teach the difference between memory and hard drive was that I would have my students create (with my help) a small program and we would run the program. They would be excited to see their program run. Then we would shut down the computer and then turn it back on and I would ask them where is there program. Gone. Some were a little disappointed at this point but it was an easy “hard lesson”. At this point we would recreate the simple program and the difference was at this point we would save it to the hard drive. That is the important concept _ “to save your memory work to the hard drive”. Then we would turn the computer off and back on again but this time they could retrieve there program that they had worked on because it was saved to the hard drive. The concept was we worked from memory and stored are work on the hard drive so we would not lose it. Then we worked on data but the concept of loosing your data if not stored to the hard drive was easier to teach. RAM may also have an operating system limitation. As an aspiring A+ tech, I’m training myself to understand this simple fact: that while I find computers and all their glorious underpinnings to be supremely fascinating, most users don’t. They couldn’t give a fig about the whys and whats of a computer malfunction, they just want the darn thing to work. Most users can’t be bothered with learning details about how computers operate, and in fact they shouldn’t have to. The end of that comment, “they shouldn’t have to” got me to thinking. Probably it should be qualified (and I bet Tom R would agree) based on where someone is working on his computer, and perhaps some other things as well. For instance, if at work where one has access to a A+ tech, maybe they would have to know little about how the computer works and therefore could focus more on what they are trying to accomplish, as they rightly should as Tom points out. However, I’m sure we all know just how many times we’ve had to help those who know precious little about “the whys and whats of a computer”. Having helped folks out on thousands of problems, one can only imagine how much time was wasted waiting on me to get there, or how much time was wasted and how much frustration was expressed because of misunderstanding their computer. One person I know spent almost a year writing a book, only to have it completely disappear when her computer unexpectedly shut down, she having not ever saved it to her hard drive, and relying solely on her memory and never turning off her computer. So while agree with the spirit of what Tom wrote, I can’t help but think that most folks are much better off when they understand a good bit about how it all works. My statement is more along the lines of automobiles – most people have no clue what goes on under the hood, yet they can successfully use their cars for years without issues. When deeper knowedge is required then experts (mechanics, etc.) are called upon. There is some basic knowledge required (how to drive, don’t ignore the “check engine” light), but it’s very basic in comparison to how a car actually functions. Computers, on the other hand, still pretty much require that you not only pay attention to the equivalent of a “check engine” light, but that you actually are able to perform some amount of diagnostic work on your own. In an ideal world that would not be necessary. That’s the “shouldn’t have to” part. They should be able to use it without needing to know details of how it works. I suspect back in the days of Model T’s it was necessary to have some knowledge of how a car worked in order to use it successfully. We are at that point in history with computers although they are getting easier to use. If she was using a word processing program like Word or Open/Libre Office Write, there would have been an autosaved version of the file. Perhaps she can search for that. Normally when opening the word processor again, it should offer to save the autosaved version as a document file. The computer stores all its programs and data on the hard drive but can’t work with it there; it has to move it out into RAM to be able to work with it. In the kitchen, the food is stored in the refridgerator or a cupboard but, like the computer’s hard drive, you can’t work with it while it’s in there. You have to take it out and work with it on the counter or worktop – the kitchen equivalent of RAM. If you only have a small counter you can only work with a small amount of food at any one time. You then have to put that back in the refridgerator while you get something else out to work on. However, if you have a bigger counter you can work on more things at once, becoming more efficient and productive, just as adding more RAM into your computer makes that more efficient. Very well written. Enjoyed it. I would have thought that you could argue that whats on the hard drive and what is in the flash drive is analogous to human memory and curiously what is in RAM is more like the active part of a brain rather than memory since it is like a running programme. Therefore in one way your description is counter intuitive although of course I accept absolutely how you define these things. These analogies are all helpful, as were Leo’s explanations. I’m one of those people who mainly just want the computer to work, in the same sense that I can drive a car without being a mechanic. But I DO like having the big picture when it comes to computers. I may not see all the beautiful structure, etc. that a technician does, but the better I understand it, the better, I think, I can use them. Years ago, I was more on the cutting edge than I am now, but computers were simpler then. I think the more we understand, the better an idea we may have, for example, when something does go wrong. One of the big frustrations of having a major computer problem is that most nontechnical computer users can’t fix them themselves, and getting an appointment for a repair or check can take a long time. It’s much easier to have a car serviced than to have a computer serviced. 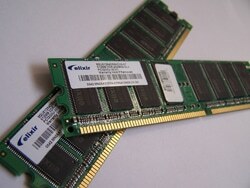 Does RAM really mean ‘Random Access Memory’? ‘Random’ means without reason or predictability but everything that happens in a computer is programmed and logical. It means it can be accessed randomly – meaning you don’t have to read bytes in any particular order, you can get to each byte of memory directly and, if you like, randomly. Contrast that with storage mechanisms that required you to read through a bunch of things you didn’t care about to get to the thing you wanted. The term RAM goes way back into computer history. In the early days, all sorts of technologies were used to store data… like springs, tubes of mercury, and CRTs (I kid you not); with these technologies you had to scan the entire data stream to access the datum you wanted. The development of a technology like core memory, where a memory word could be addressed and accessed at random (Random Access Memory) was a game changer. The analogy I use that seems to be easy for people to understand is to think of an office setting. You have a desk, and you have a couple file cabinets. The bigger the desk, the more papers, or “stuff” you can have open and laying out on your desk. This is memory – the more you have, the more “stuff” you can have out and working on. When it comes to putting everything away when you leave, you put all the papers back in the file cabinets (Hard drives, jump drives, etc.). When you turn off the lights as you walk out, everything left on your desk gets run into the shredder! hey SNERT: – yes, RAM really does stand for Random Access Memory, because any storage location in it can be accessed at random, without any regard to which locations have already been accessed. This is a very old term, which dates back many decades to the early computers which used all sorts of things to store working memory – mercury delay lines, CRT storage scopes, and more I can’t remember. Human ingenuity knows no bounds – but both of the devices I mentioned are serial access devices – you have to work your way though all (or many) stored locations to access the one you want. Random access (as in core memory) saves an enormous amount of time. It is possibly worth noting that bubble memory (and possibly flash) is a serial access technology – but it’s so fast and arranged in such a way it’s hardly noticed. This is really weird… I just replied to Snert myself, saying almost exactly the same thing…. I also thought about mentioning flash and bubbles but decided agin it. Very clearly put and interesting. Ttwo thumbs up! 1) Random: meaning any memory location can be accessed at any time. Contrast this to an 8-hour VCR tape. When the tape is rewound to be beginning, you can’t get to what’s at the “hour 5” point without forwarding past the first 4 hours first. On a random-access device, you can jump directly to the “hour 5” point regardless to where you were when you started. First, imagine that the memory in your head is like the memory in your computer. For this case, pretend like the memory in your head is erased every time you go to sleep and is completely empty and fresh when you wake up. Now think of a book. Let’s say the book is Steinbeck’s “The Grapes of Wrath”. This book equates to your hard drive. So now you open the book and read the first chapter. After that, all day, that first chapter is in your memory and you can recite it to anyone you want, all day long. But when you wake up tomorrow, it’s gone because your memory is erased during sleep. You can always get another copy of this chapter back into your memory; all you have to do is read the book again, because the information is permanently stored in there. But it will only be retained in memory until the memory is turned off…. I’m comparing desktops online right now since I’m considering getting a new one, and I keep seeing “Maximum memory” and “Total Hard drive capacity,” where the numbers vary greatly. I didn’t know that memory referred to RAM, but now I know better. Thanks for clarifying the difference between RAM and Hard drive! The flash bit on the USB was a bonus for me. I didn’t know why people switched terms between USB and flash sometimes b/c they seemed like two different things. USB is the connection and interface – you’ll find many different types of devices that connect via USB. Flash, in this context, is the technology and type of memory used in USB memory sticks, also called thumbdrives. Nicely put. Do you recall magnetic core memory.? I recall a PDP 10 with 8kbytes. Things change. That’s why we have dryer sheets. Memory sticks. Your articles should be REQUIRED reading for anyone in college, especially Computer Science or Data Management. Graduate degree circa: IMB 360, IBM XT, Cobol, Assembler, etc. Sons & daughters: Accenture, IT analysts, worldwide data base managers, IBM, etc. As if things weren’t bad enough there is a large number of geniuses out there who refer to the storage on their smartphone as RAM. And these guys tend to think they’re highly knowledgeable about this stuff. So they really think they know a lot, even though they think RAM means storage. Which means they know absolutely nothing. except maybe how to use a smart phone. Why do PC makers Knowingly and incorrectly refer to hard drive storage space as “Memory” when in reality, Nothing about the hard drive or it’s space is ever referred to as memory? Why confuse the masses? See the insanity in action here in the ad for the new Asus Vivo Tab 8, which says, “The tablet offers a screen resolution of 1200 x 800, Intel Atom Z3745 quad-core processor, 1 or 2 GB RAM, 32 GB internal memory, 2 MP front and rear cameras, Wi-Fi 802.11 a/b/g/n, Bluetooth 4.0 and a microSD card reader. “Why not simply say 32 GB internal storage space”? It makes the manufacturers look very ignorant so to the point if the ad’s are that incorrect, the product must be Crap. As in this case, I’d never buy an Asus product now. i know upgrading of Ram in desktop is posible but my question is can laptop Ram be upgraded(does it hav d that desktop RAM socket dat can enable d user to buy an add or to replace d old smaller gigerbyte sized ram wit a new bigger gigerbyte sized Ram. Laptop ram is upgradeable. I’ve upgraded several laptops. Thanks Leo for giving us such good informational stuff.I liked because you wrote in simple easy language. Why space of hard disk is increces while ize of the hard disk is decreses??? WHY???????? kindly what is the concept of volatility with regard to RAM and Hard disk? RAM is volatile which means that when the computer’s power is turned off, the contents of RAM disappear. The hadrd drive and flash memory are non-volatile, and the stored contents on those media remain intact when the power is turned off.